Grafting: the horticultural technique of combining plant tissues to continue growing together. Scion: last year’s new growth from a desired fruit tree variety that is grafted to rootstock. Rootstock: a rooted seedling fruit tree that imparts genetic strengths possibly absent in scionwood, such as hardiness in some form like drought or cold tolerance or semi-dwarf mature trees for ease of harvesting. 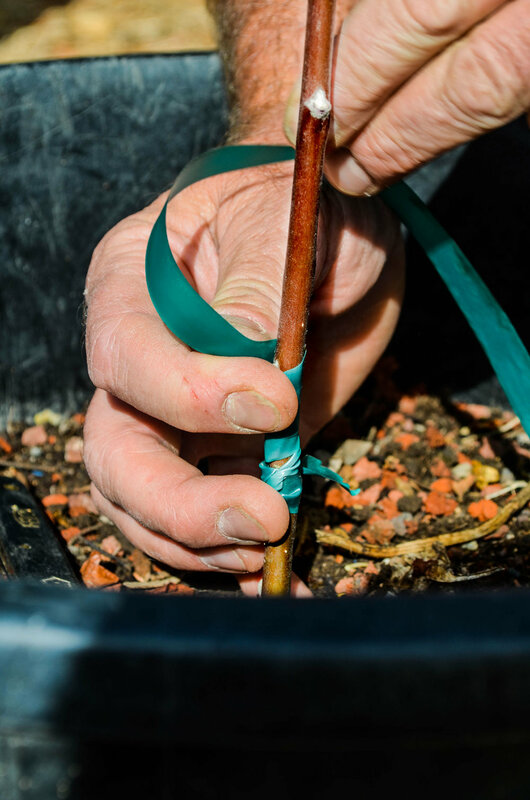 Whip graft: a graft whereby a diagonal cut is made across the top of rootstock paired to matching diagonal cut on the scion. 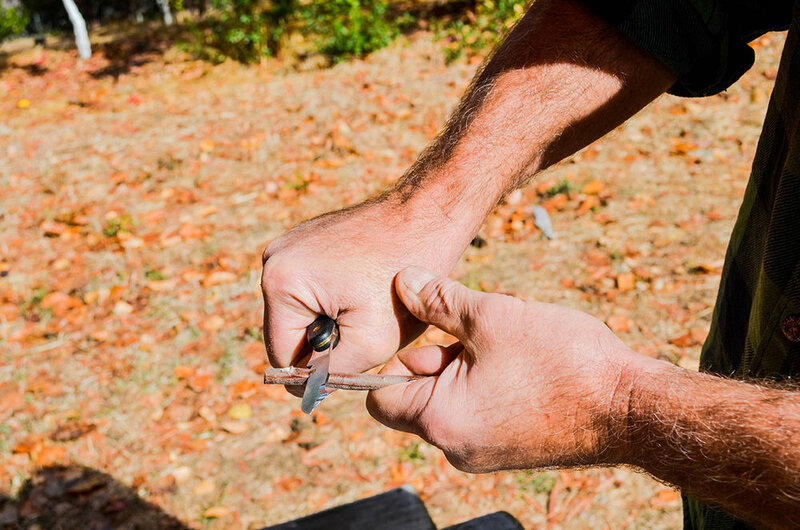 Whip Tongue graft: a whip graft that has an additional small diagonal cut midway on both scion and rootstock that has the added benefit of holding the scion and rootstock graft through opposing tension of plant tissue. Cut the scion at a point where it has a similar diameter as the root stock. Carve the end of the scion into an angle. The first interior layer beneath the bark is the xylem. The graft should pair the scion’s xylem with the rootstock’s xylem so water and nutrients can flow through one to the other. Add a vertical cut in the center of each angled portion that will allow the two parts to fit snugly. Slide the two angled portions together, forcing the cuts apart to insert the opposing wedges. Wrap tightly with gardener’s tape. Leave the tape on for 12 months or when the swelling graft seems to push the tape outward. Example of a mature graft. Andy inspects his collection of grafted trees.